AS IF our 100% losing record at The Emirates wouldn’t be reason enough to view games against Arsenal with a sense of impending dread then the absolute certainty of what the media are going to allow to dominate the pre-match and post-match discussion is. No Stoke v. Arsenal game is allowed to pass without constant reference to that awful day in February 2010 when Aaron Ramsey suffered a terrible leg injury after being tackled by our skipper Ryan Shawcross. It was a terrible accident, with no malice of forethought, and not something which Ryan Shawcross would ever do deliberately. It was one of those things which happens in football but it was an accident. We’ll sit down with anyone and watch the video, showing them how it’s actually Bendtner pulling back on our player’s shirt which makes him ever so slightly late for the challenge. It’s not surprising that it garnered so much discussion and controversy at the time and even though almost all non-aligned pundits and fans could see it for the accident it was, Arsenal players, supporters and the manager wanted to express their rage, their indignation and their frustration. We could all understand that and would hope that others would understand why we would rush to defend our player too. In time you’d expect these things to start to die down and, in truth, they usually do. How many times do you see the media talking about Robbie Elliott breaking Rory Delap’s leg? Or Nigel De Jong breaking Hatem Ben Arfa’s leg? 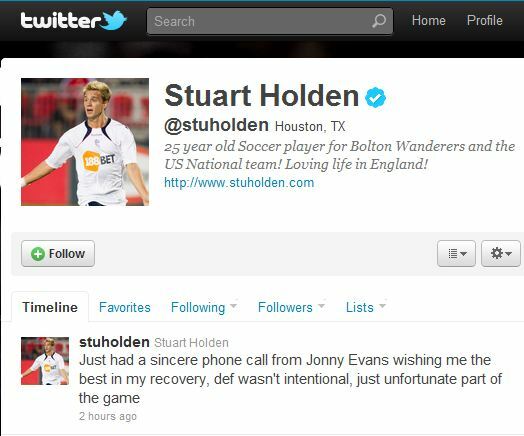 Or Jonny Evans breaking Stuart Holden’s leg? Arsenal fans though, ably backed up by a media who really should have higher standards, continue to keep the incident at the forefront of everybody’s minds (as though their hordes of pissed-up past heroes never did any wrong). No TV interview failed to hark back to the incident and it got to the point where you started to wonder how they were going to twist the conversation to mention it. If it was mentioned once over the Friday, Saturday and Sunday then it was mentioned fifty times! Arsenal fans switched into turbo mode too, with their Internet articles full of the usual misinformation and warped interpretation of events. They also spent the entire match booing Ryan Shawcross, which is an act they usually save for their own players and which didn’t seem to bother our skipper at all. Even Arsenal FC got in on the act too by picturing – surprise, surprise – Ramsey on the front cover of the official matchday programme. The saddest sight of all though was to see Aaron Ramsey himself celebrating his early goal by rushing directly towards the Stoke support, smiling, pointing and giving us the “shush” sign. How very disappointing. A chance to act with real dignity, to mark his fantastic return to form with a gesture of diplomacy and maturity but instead opting to go for the Pantomime option. Well, Ramsey has now ensured that he’ll get it with both barrels when he next comes to The Brit and we’ll all get branded as “scum” by a media who’ve already got their scripts written and who do actually hope that their pre-match playing up of the incident results in just such a thing occurring, so that they can keep the story fuelled and provide themselves with an excuse to keep it all going. There’s sadly nothing we can do here. It’s destined to be a never-ending story which the media, Arsenal, their fans and the player himself just don’t want to let drop.